There’s a lot you can do to broaden your company’s environmental responsibility beyond just eliminating plastic in packaging. Below are a few areas where you can reduce your footprint. Think about ways to minimize the overall size of the product that requires packaging. 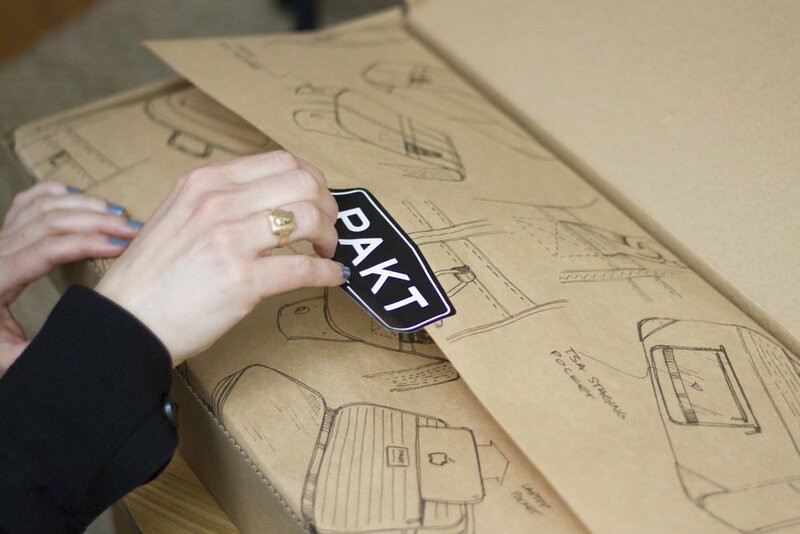 For example, with the Pakt One, we found a way to fold the bag so it fit neatly into a much lower profile box. Many bags are packaged with stuffing so that they look good on retail displays. By flat packing the Pakt One each bag required a third of the space of a stuffed bag which meant we could fit three times as many bags in a shipping container. This meant the ocean freight carbon footprint was also slashed by approximately two-thirds. The bonus is that cargo shipments like that are generally charged by volume so we were also cutting the freight costs by two-thirds. Instead of picking a box size from a supplier’s catalogue, design your own box to the dimensions of your product. Brown cardboard boxes are very inexpensive and you’ll increase the number of items that can be shipped at once if they are sized as small as possible. This reduces the total amount of fuel needed to get your product to the customer. And your product won’t be clanging around in a laughably-sized box (hint, hint Amazon). Pick packaging that is lightweight, reusable, and recyclable. Avoid using mixed materials as they’re harder to recycle. Plastic films with multiple layers of paper, plastic, and foil are hard to process. Bonded packaging (the paper envelopes with plastic bubbles inside) is also difficult to recycle. Try to pick suppliers that are close to your factory. If your 3PL is close to your factory, that is great too but only if it is also central to where your products will be shipped. The goal is to reduce total shipping distances, and therefore the total fossil fuels needed to transport all the materials involved in your business. Plan ahead! When you ship the product from the factory to your 3PL leave enough time so you can opt for sea shipment over air. The emissions are lower and it is much more cost-effective. Again, if your 3PL is located centrally within the territory that you ship the most product it will save on total distance shipped, cutting emissions. These are just a few ways you can be more environmentally responsible when developing and shipping a product. We’re constantly learning more and will be updating you as we make more packaging and learn from our experiences. Please reach out if you have any questions about how we designed, sourced, or shipped our products. We’re happy to help you switch to plastic-free packaging any way we can.